DNF such a positive experience…how?! 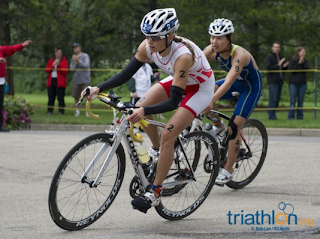 Going all the way back to the beginning of July ITU World Cup Edmonton was a little disappointing. I went to Edmonton hoping for a big result. Those horrendous blisters, suffered in the Europeans, had healed well but I was still only able to manage an 8th place finish. However 8th is still a respectable result and I was able to take many positives from this high finish despite a disappointing race. One positive that I was not able to take away from this race was an intestinal parasite (Giardia Lamblia). The evening before my start in Edmonton I was feeling very nausious, I put this down to race nerves/excitement. On race morning the nausea was still there and throughout the course of the race only got worse. The 10 km run was simply a case of survival to the finish line all that kept me going was olympic points. My recovery after Edmonton was extremely bad and I simply wanted to just sleep, sleep, sleep. The nausea was always present and it now became a big concern that I was suffering from more than just travel sickness. My energy levels really deterioated and the easiest of training sessions was putting me in bed for 2 – 3 hours immediately after. I wasted no time in getting stool samples tested however the results were negative. This now was very alarming as I was still in a very low training phase and even after a 3 day period of completely nothing my symptoms were still the same and I was exhuasted. While awaiting my blood test results I got informed of the parasite Giardia Lamblia. My symptoms were an exact match. With the parasite commonly found in infected water in Canada and South America I was convinced I had found the cause of my problems. Fortunately I was able to contact a very well respected doctor in Denmark, Martin Kroll. Martin was excellent and wasted no time in waiting for blood test results and prescribed me with a very strong dose of anti-biotics. 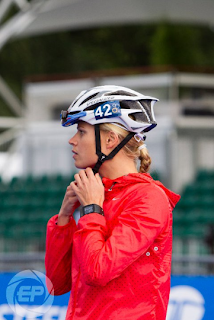 On deciding to race London I had decided to DNF. Of course on paper this does not look great, however I had convinced myself that the result on this day did not matter and will not determine the result in one years time. Come race day I was very relaxed, I had forgotten it was the Olympic test event and more importantly I was feeling confident that I could race well. I planned to race hard and see just what I had in me. The swim was a tough one, quite a battle on times but still I exited towards the front. Once onto the bike I did not want to just sit in, what was the point? I did not need to save my legs for the run but still I needed to get something out of it. So I did. I pushed the bike hard. I wanted to see exactly what this bike course had in store for us, what type of racer it suited. I cemented my position on the front of the group for a number of laps. Once I was satisfied I had got what I came for I kept out of trouble. 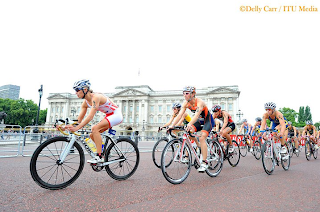 My positive experience now allows me to design my training and perfect my skills to benefit my race in London next year. Of course I will still need to run 10 km after the bike and did not get any experience of the run course. Do I need it? Of course it is better to have it but there is no denying it is flat, fast and will be extremely painful. I am pretty sure I can set myself up for that. Having now returned from London I am looking forward to the rest of the year and gaining full race fitness. My next goal is Beijing and Yokohama WCS. I will now head to Karlovy Vary, Czech Republic where I will race a European Cup as part of my preparation for these two big events. As a result of this parasite infection I will now look to race late into October and possibly November but no official plan is made yet. Just take one race at a time. 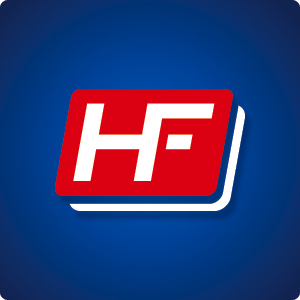 To coincide with the launch of my new coaching company HF Triathlon I am soon re-launching my personal website www.hellefrederiksen.com. This will really allow my followers an inside look into MyWorld. I am soon able to announce the addition of a new sponsor to my support team. Please continue to check both sites along with my Facebook and Twitter pages for more information on the re-launch and the unveiling of this new sponsor.